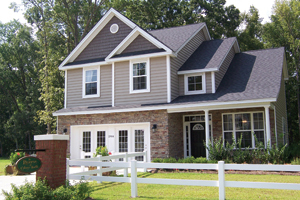 Dan Ryan Builders is not in the business of building custom homes, choosing instead to provide a quality product at a price that is well within the reach of a wide range of potential buyers. But the company, which dipped into the Charleston market in 2007 and is already selling and building in four neighborhoods, does display a penchant for making each of its homes just a little bit different from the rest. "I work to make something unique about every house," says Charleston Division President Albert van Overeem. "Customers appreciate the fact that we can be flexible." At The Reserve at Colony North, for example, Dan Ryan Builders offers eight distinct models, from the 1,218-square-foot Coosaw to the 2,357-square-foot Peninsula. Each can be purchased with upgrades that include bonus rooms and additional bedrooms and bathrooms. Some even offer unusual touches such as angled stairways. Among the many standard features are 9-foot smooth ceilings on the first floor, pre-wiring for ceiling fans, cable and phones, satin nickel door hardware, smoke detectors, deadbolts on exterior doors, 36-inch kitchen cabinets, Moen chrome faucets, an icemaker hookup for the refrigerator, General Electric kitchen appliances and hardwood foyers. "We could have stripped out all the options and offered a basic home, but that's not our philosophy," van Overeem points out. "We provide the best quality possible." Prices at The Reserve at Colony North range from $131,000 to the low $180s. Since mid-2007, Dan Ryan Builders has sold 65 homes in the neighborhood and is now moving into phase 2, where another 67 lots are being offered, many with large live oaks and other mature trees. During phase 1, Ryan Builders attracted a wide range of residents, including first-time buyers, retirees, empty nesters, young families and active and retired military families. "It's a very diverse neighborhood," says Community Sales Manager Pam Tinsley. She adds that quality construction, affordable prices, flexible floor plans and ubiquitous shade trees are not the only reasons home-buyers have chosen to settle at The Reserve at Colony North. Location, of course, is also important. "The neighborhood's proximity to Interstate 26, shopping, the airport, the Air Force Base and everything else in North Charleston and beyond has really been helpful," she points out. In addition to The Reserve at Colony North, Dan Ryan Builders is currently building homes in Bridlewood Farms in Ridgeville; Royal Oaks in Goose Creek; and Palmetto Village at Spring Grove Plantation. For more information, contact Community Sales Manager Pam Tinsley at (843) 820-2505, (843) 797-0840, (843) 737-3625 or ptinsley@danryanbuilders.com. Advertise on this web site for FREE! © 2019 Media Services Inc - Internet Marketing Services.